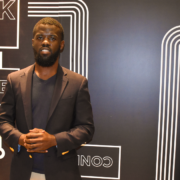 This year Black Tech Week was a blur for me, again. lol The reason being is, my startup has moved away from: a napkin, different startup programs and now to an actual working MVP with real clients. Thus, preventing me from attending conferences as I did while still figuring out the tech landscape. 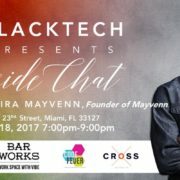 I had the pleasure of being part of Black Tech Weeks 2018 VC in residence program for a week, 2nd time for me! Blessed! Balancing my small business called Magnitax.com and my start up, Shngli App this program really jump started some growth ideas for me. The conference brought me peace and happiness because based on a few moves, I was unsure where I stood in the Financial Tech landscape. Yes, from the image above you can see that I am once again a solo founder at the moment and it is not fun, especially when it comes around conference time. However I was able to meet a lot of new entrepreneurs and other successful entrepreneurs who reminded me that the journey is not over. If you’re looking to join my startup team, give me a ring at shngli.com. Miami and south Florida’s poppin tech scene encourages many entrepreneurial activities (hyperlink to breakdown of activities) at the moment. One thing I can say that Black Tech week does right is the feeling of having a family reunion with a bunch of strangers in a city where most people think about the beaches and parties. If you are looking at adventuring in Miami, check out this guide. Who knows what will come out of these relationships but what I do know is, to be successful as a black entrepreneur unless I work with more entrepreneurs who understand my strengths and weaknesses. Don’t attend workshops that are your strengths. Don’t just pass out business cards! Learn more than surface level information, this could truly expand your startup! Until next time, build your best startup and remember it really does take a Tribe to grow your brand! Dope Tech Presents: Fireside chat with Moisey Uretsky, co-founder and Chief Product Officer at DigitalOcean, and Alex Nabutovsky, co-founder and CEO of BelugaCDN. http://whoisdesir.com/wp-content/uploads/2017/05/Photo-FiresideChat-RefreshWynwood-Feb2017.png 600 1000 Jean-Désir Jean-Désir2017-02-10 08:00:302017-05-09 16:06:33Dope Tech Presents: Fireside chat with Moisey Uretsky, co-founder and Chief Product Officer at DigitalOcean, and Alex Nabutovsky, co-founder and CEO of BelugaCDN.